What phone does Aamir Khan use? You know what, that’s a great question. A question for which we might not find the answer easily. But we can make some intelligent guesses. My guess is Aamir Khan is using a Android powered phone, and probably the one of the few celebrities (NTR from Telugu movie uses one) who isn’t using an iPhone or a Blackberry. I know we can always expect something new from this Khan. But what about Mallika Sherawat? What toys, sorry, what gadgets does she use? Mallika seems to be liking her toys. While her last tweet came from a Blackberry she has previously used an iPhone and an Android powered phone. The easiest way to find out is to call them up and ask. We might not necessarily have all of their phone numbers, but we have the next best thing – their twitter handle. Twitter is the biggest beehive of Indian celebrities, though they don’t share much, we can find out quite a few things. We can find out what time they sleep, what they tweet about, what they share, what they care and of course, what gadget they are using to tweet. Blackberry is the undisputed leader in the smartphone category. It is distantly followed by iPhone and remotely followed by Android. iPad as a tablet looks like a popular choice amongst celebrities who chose to tweet from one. 1.5 Why is Blackberry the most popular gadget? Madhuri Dixit, Shah Rukh Khan, Murali Kartik and Dino Morea have all tweeted from an iPad. Madhuri Dixit is an Apple fan girl. She owns (I presume) an iPad, iPhone and a Mac. Telugu movie star Nagarjuna is also a Apple fanboy. He has tweeted from iPad and an iPhone. Priyanka Chopra and Gul Panang are the only two celebrities who have used a Nokia phone to tweet. An indication that Nokia isn’t doing too well in the smartphone segment. Priyanka might jump to an Android whenever her contract with Nokia ends. I don’t know Priyanka very well but that’s a hunch. iPad and Blackberry are the top choices of Indian celebrities. The celebrities in this list are picked from Pinstorm’s India influencers which uses Klout, PeerIndex scores to arrive at an aggregated ranking. Salman Khan is the top celebrity with a Aggregate score of 76.5 and he uses Blackberry. Preity Zinta has an aggregate score of 76.3 and she uses Blackberry too. There are some celebrities who are not on Pinstorm’s list but I have added them, because I felt like it. Madhuri Dixit : iPhone, iPad, Mac – An Apple fan girl. Few folks have used either web, tweet deck or Uber social. The gadget used cannot be found out with these twitter clients. Narendra Modi has used Tweet Deck. While Sid Mallya, Deepika Padukone, Riteish D and Hrithik Roshan have used Uber Social. 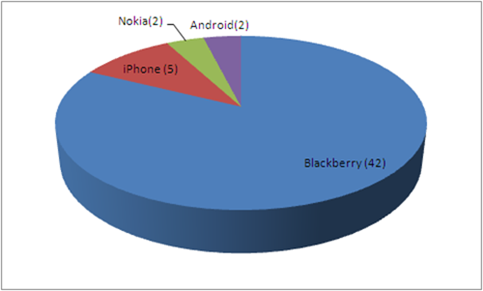 Why is Blackberry the most popular gadget? Is it the keypad? If yes, there are a lot of Android (HTC, Samsung) phones which come with pretty nice keypads they throw in a touch screen too. Nokia E7 is one of the nicest mobiles with a keypad. E7 might actually help these celebs typing skills too. Do you know of any other celeb using Android, iPhone or anything non-Blackberry? Let us know. "Mobile Gadgets used by Indian Celebrities [Compilation]", 5 out of 5 based on 1 ratings. Blackberry Messenger gets Voice over Wi-Fi! Do you know which mobile gadget does yuvraj singh use? Do you have any idea which mobile phone or gadget does Yuvraj Singh uses? hi guys , i think ram charan tej uses apple iphone 4…my 6th sense is saying..
Samsung Wave 525 is very nice basic smartphone. Very easy to handle. Camera quality & music quality is also very nice. As many says that, this phone get switch off while using internet which is not true as per my experience. But samsung mobile phone has to improve its battery power. A fun article to read! I always used to wonder which phones do these rich and famous guys use. Thanks for sharing this with us! Exactly so. Android is unbeatable and BB is an old junk. rohit sharma-blackberry, sreesanth-blackberry, suresh raina-blackberry. always dreamd never thought someone will compile a list and share. Good point. That’s one way to look at it. On a second thought, is that the only way to look at it? Superb!! good to see many people on Blackberry. They are mostly using Blackberry because of its data privacy and security credentials.